In Ahmedabad, Vastrapur police arrested 7 persons enjoying liquor party in Regent Park Bungalows. Based on clue, Vastrapur police raided Regent Park Bungalows in Vastrapur where from Mohil Patel who is working Nagpur along with 9 others were arrested by police. There were 3 girls in the party. Mohil was identified by police, he admitted of holding liquor party on his birthday. Police has lodged the case and started further investigation. After Diwali Gujarat government has given a special gift to Navsari district development authority for Navsari Nagar Palika and Vijalpur Nagar Palika. 39 villages of Navsari Taluka and 48 villages of Jalalpor were covered under NUDA, Navsari Urban Development Authority, as per sources. 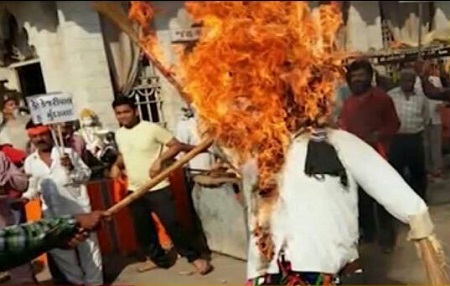 Today in Gujarat at Gondal, effigy of Arvind Kejriwal was burnt by Vishwa Hindu Parishad and Bajrang Dal Gondal at Sarkoshi Mandir over Kejriwal’s as Delhi CM Arvind Kejriwal had recently posted a cartoon picture on Twitter insulting Lord Hanuman. One VHP worker was arrested by Police, as per sources.